You know how when you eat something at a friend’s house that is so delicious you hope to leave with the recipe? This is one of those recipes. When I first looked at the ingredient list, I thought it was a crazy combination of ingredients. But it works. I have served this shrimp dish countless times in the years since I first sunk my teeth into them and my friend, Jen, kindly shared her recipe. It always gets rave reviews and last night was no different. All you need are some basic pantry ingredients, one lemon, and a bag of shrimp in your freezer. Perfect as an hors d’oeuvre or an entrée, there have been arguments over the last piece, if that tells you anything! To make preparation super simple, purchase a frozen, two-pound bag of peeled and deveined shrimp with the tails on. Just be sure to thaw completely and drain well. The marinade may be prepared a day in advance and refrigerated. When serving as an appetizer for company, I grill the shrimp within a half an hour before guests arrive and serve at room temperature. Peel and devein shrimp leaving tails in tact. In a large bowl, whisk the remaining ingredients together. Add shrimp to the bowl or put everything in a zipper-top bag and marinate in the refrigerator for a half an hour to two hours. Drain marinade. Skewer the shrimp and grill over medium heat, 3 minutes per side, or just until pink. Serve on skewers or remove to a serving dish. May serve hot or room temperature. 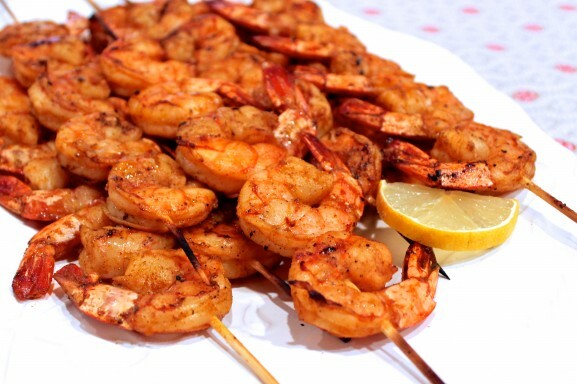 Soak wooden skewers in water for about a half an hour prior to threading the shrimp so they don’t burn on the grill. Sometimes, I use half the marinade recipe for a two-pound bag of shrimp and marinate on the longer end of the suggested time frame. It really is enough to coat the shrimp and stretches your ingredients a little further. If your spice blend contains salt, I recommend a low-sodium soy sauce. Serve with corn bread and edamame or steamed broccoli for an easy, delicious entree option. This was fantastic! The shrimp were so tasty. Thank you for the recipe! You are welcome, Shannon, and I am thrilled you enjoyed them! They always go fast here! Ann, I want to make these on Christmas. Can I just put them in the broiler? My grill is packed away. Do you have instructions for broiler or oven? 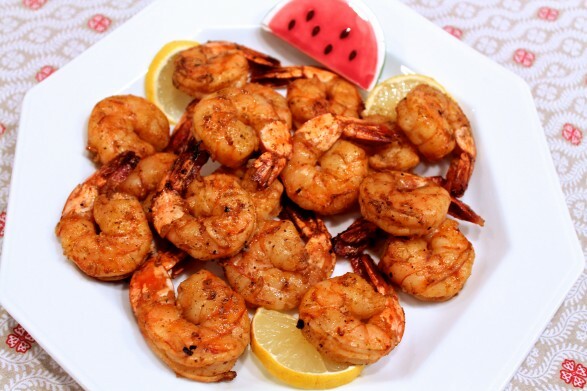 I would broil a minute or two per side–it won’t take long and exact time will vary a bit from oven to oven as well as how close to the heating element the shrimp are. Just keep an eye on them as they will be finished as soon as they turn pink. Hope you enjoy! I’m so glad it was a success. Thanks for the great feedback, Janet! Thank you very much, Monica! This recipe is the bomb! Everyone loved it!! !